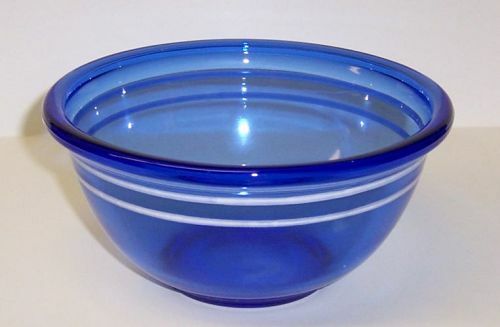 This is a really nice Cobalt blue, with white bands decoration, 6 Inch diameter Utility Bowl made by Hazel Atlas. The Bowl measures 3 inches high and is in very good condition with no chips, cracks or scratches. The painted white bands are all very good. Be sure to search our other kitchen items available. We guarantee items to be as described. THANK YOU. 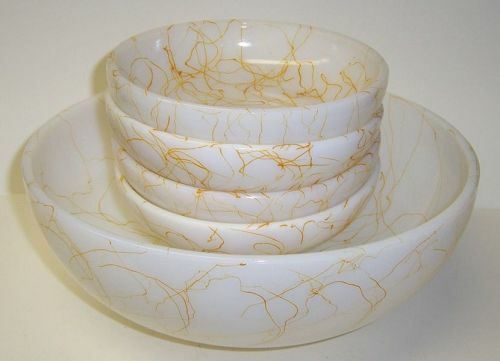 This is a really great Drizzle, aka Spaghetti, 5 Piece Salad Bowl Set made by Hazel Atlas Glass in the 1940s. This set consists of one 10 inch large salad bowl and four 6 inch individual salad bowls. All five bowls are in very good condition with no chips or cracks. We guarantee items to be as described. THANK YOU.